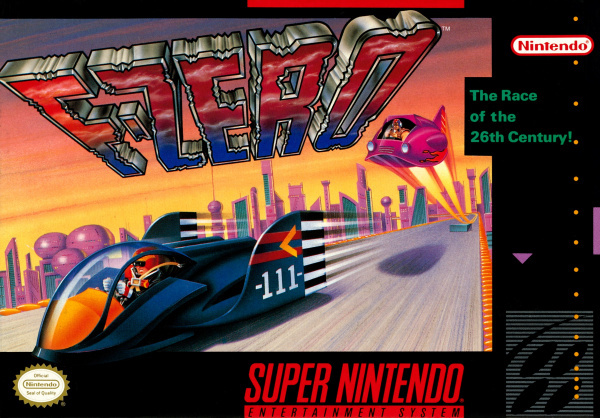 Looking at it today, it’s genuinely hard to believe that F-Zero was a SNES launch title. For a game that is now over two decades old, it remains remarkably impressive from a purely visual standpoint. The Mode 7 rotational and scaling effects — which were relatively new to console players back in 1990 — still look striking, and it’s almost impossible to see how the bold and colourful graphics could be realistically improved upon — in 2D terms, at least. Of course, F-Zero has not become such a beloved classic based purely on its aesthetics; beneath the smoothly rotating track there lies an incredibly playable racer which effectively lays down the blueprint for Super Mario Kart, which would emerge from Nintendo’s labs just under two years later. As the title suggests, this is the futuristic equivalent of modern Formula One racing, with powerful racing machines gliding above — rather than driving directly on — the track. Although the N64 sequel would add more racers and the ability to use a spin attack on your rivals, the SNES original keeps things surprisingly pure. The aim is simply to finish first on each course. Each race is divided into five laps, and speed boosts are earned for each successful lap, with a maximum of three being stored at any one time. Damage is taken whenever you collide with a rival driver or make contact with the electrified barrier which surrounds most of the track; you can replenish your ship's shield by heading to the pit lane, which is found near the start/finish line. Although there’s a host of vehicles participating in each race, you can only select from four — all the remaining craft look identical. This is possibly the only shortcoming of F-Zero’s presentation, and is something that would be remedied by the aforementioned sequel, which featured a massive roster of flamboyant drivers and equally unusual ships. All in all, there are fifteen tracks split between three different leagues, and four different difficulty levels to master — although only three are accessible initially, with the fourth becoming available once you’ve completed all the leagues on beginner, standard and expert. Totally completing the game is not a task which can be taken lightly, and even when you’ve done so, there’s always the allure of beating your best time on any given circuit. The same could be said of any racing game of course, but F-Zero’s tracks are so well designed that they practically beg for repeat play. 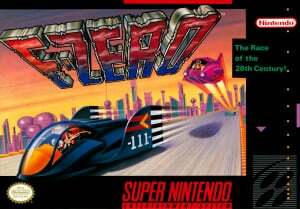 As mentioned previously, F-Zero can be considered something of a forerunner to the SNES version of Mario Kart. The controls are very similar, with the L and R shoulder buttons being used to bank your craft in the desired direction and thereby add emphasis to sharp turns. This move can be seen as a very early example of the power slide in Super Mario Kart, and adds a massive amount of depth to the game — clever use of this banking technique can shave seconds off your final time. We’ve spoken about the attractive visuals at length but F-Zero’s aural experience is just as worthy of praise. From the perfect sound effects to the fantastic music, this game certainly doesn’t disappoint. Notable tunes include the rousing title screen track to Mute City’s urgent accompaniment. Another personal favourite in the Nintendo Life office is the haunting Port Town music — it’s bathed in a melancholy that has no right to exist in a game about racing at speeds in excess of 500 km/h, but it seems to suit the action perfectly nonetheless. If you wanted to be really picky you could point out that the lack of a two-player competitive mode robs F-Zero of longevity; it’s a difficult argument to refute when you consider how popular Super Mario Kart’s split-screen multiplayer portion was (and still is). However, this is almost the only real criticism you can level at the game — it doesn’t put a foot wrong anywhere else. This Wii U edition features wonderfully up-scaled visuals which look absolutely pin-sharp over a high definition HDMI connection. Even if you’ve played the game on a SNES with a crystal-clear RGB SCART output, you’ll be massively impressed with the results on offer here. Save states also make the cut, allowing players with busy social lives to get through each league without having to do it all in a single sitting. Most important of all — to European gamers, at least — is 60Hz support. This means that PAL players get to enjoy the same experience as everyone else. It’s also worth noting that like the other Wii U Virtual Console title to date, you can play entirely on the GamePad’s screen. F-Zero might lack the embellishments of its N64 successor and could really benefit from a two-player mode, but that doesn’t detract from the overall experience. This is a classic racer which has a level of purity and playability that rival titles have been struggling to emulate ever since. From the tight controls to the impeccable course design and timeless presentation, F-Zero is a joy to behold — and it pleases us immensely to report that the Wii U Virtual Console edition is the best one yet. I've never loved you more, McFerran. I've played this more over the past weekend than I ever did when I owned it on the SNES. When I first saw this back in the day running on a Japanese SNES, I was blown away. Still awesome today. And 30p! Bargain. Nice review! I'm really enjoying this, and it's really worth the $0.30! I was a Genesis kid. Sold my NES to get one. But then the SNES kiosk was put up at the local Kay Bee Toy Store in the mall - with F-ZERO as the starring title. This was before "timed play" at demo kiosks and I would sit there for as long as I could. I never bought an SNES. I would rent one for a weekend to play the big games. F-ZERO, though, became something of an obsession. Years later, at my friend Duane's house, we would play that and MK II long into the morning; shaving seconds off our times and challenging eachother. Then F-ZERO X came out and it continued. The F-ZERO franchise remains my favorite racing series to this day, with BURNOUT trailing about half a lap behind. In my opinion F-ZERO GX was one of the top 5 titles on the GCN and looks better than most racers do today, but nothing will ever beat the purity of the race which the first game captures so beautifully. F-Zero is really a legendary game. Think about it: If you didnt know anything about the game and hear "only four cars, completely flat tracks with a handfull of terrain effeckts here and there, next to no unlockables"...it sound pretty barren. But playing it envokes such an outburst of pure joy. This is gaming what it should be, plain and simple fun. It's amazing how this game has aged. It delivers the exact same thrills it did when it was released 20 years ago. Time to step up and deliver us the ultimate F-Zero experience on Wii U, Nintendo. Can't you hear the crowd chant? "F-Zero UX! F-Zero UX! F-Zero UX!" Totally agree with this review. What a great game that has aged extremely well! They'd better 60Hz all the PAL games from now! After getting this treat there's no way I can go back. Already got it on my Wii U! Love it! I've grown soft over the years. F-Zero is too hard for me anymore. Modern racers baby the player too much to prepare us for such brutal games as the SNES offered. This is the first time I ever played an F-Zero game and its jolly-good fun! I agree with this review. I hadn't played F-Zero in a long time and booting it up again I was surprised how much there is to it. It's fast and exciting, and has a lot of finesse in its game mechanics. "Crystal clear on HDMI"? Surely you jest. Upscaling any Snes game on an HDTV looks like utter pixelated s**t. Playing on the game pad looks infinitely less pixelated and filtered. The game is good and well worth the money, don't get me wrong, but the very notion that the scaling the resolution from 240 to 720/1080 makes it look good on non-CRT TVs is a joke. At 30 cents how can you not get this game. This was definitely one of the gems of the SNES era. Playing this game again on the Wii U has brought back so many memories for me. Got this but it only re-confirmed how totally crap I am at F-Zero! @dragon_rider Totally disagree. The image looks fantastic on the TV we have in the Nintendo Life office. Playing on such a large TV through a HD connection is obviously going to make the pixels appear larger (which I personally love), but there's no bleed between colours and it looks super-sharp. Perhaps the TV you're using isn't giving the best picture? @Damo @dragon_rider Have to agree with Damo on this one. Game looks just fine on my 50" HD TV. I like playing int on the Gamepad only because I can watch TV while playing, but I've had no issues playing on the TV. I think some people like to complain, or they are graphics who***. @Damo The problem is that HDTVs can't perfectly simulate the color bleed, which is what I grew up on and as such, yes, it is crisper, we can agree on that at least, but there's something about CRTs/blurred pictures that has a charm to it I guess. NES games like Balloon Fight are filtered on HDTVs, but not Snes games? That I can't understand, oh well. I went all the way down and checked the score before reading the review. Had I seen anything lower than 8 I'd be raging. This game is absolutely fantastic. I can't believe I barely gave Maximum Velocity on 3DS a chance! Although this is still better than Velocity. I would rather play this on the 3DS. By the way, there is an error in the european pricing. The EU version costs €0.30. Only in the UK it costs £0.30. The UK isn't europe and NoE's headquarters aren't even there. Never played this back in the day (my friend with the SNES did have Mario Kart though) so it's been a nice surprise. I agree it looks fab on the 42" plasma and sounds fab through the hi-fi. Still haven't beaten the third track on Beginner, but I'll get there! With a multi-player mode I think this game would be pretty much perfect. Now, if some homebrew hackers can do stuff like this I'd really love to see Nintendo sometimes just go that extra mile with their VC titles and add in cool extras like this where it would make sense and only serve to enhance the experience. Kinda like how on XBLA where retro games all have extra stuff added to them. If only the music was louder and the sound effects were not as loud. Big Blue is the best song without a doubt. This game is just great all around and it takes me back to my 10-11 year old self. @zip There's no error, it's always the UK price on the game pages in the UK/EU section, especially as the EU and US prices are often the same in any case. We're a UK site, and as far as I know the game page prices have displayed that way since the 3DS eShop pricing launched and ditched Nintendo points. At 30 cents this gem is a steal! I played this game the whole weekend ! A-M-A-Z-I-N-G !! Wait.... F-Zero DOESN'T have a two-player mode? All this time I thought it did. @ThomasBW84 Why don't you provide prices both ways? And why do you NL ignore EU and on the other hand tell us the USA pricing? A UK website providing US pricing? It is a suggestion to improve your website, not sure if you do care after reading your last comment. If this is 60Hz can someone explain to me why my US SNES displays it at fullt screen yet through the Wii U it has boarders? Is it something simple like RGB versus HDMI? They deserve a medal for the 60Hz support. It's taken 20yrs but they're getting the message that our fragile telly boxes can handle it! So why do I have boaders? Nintendo Life, investigate this. Add me on Wii U, (my name is the same) and check the pic I just posted on Miiverse! Checking peoples pics on Miiverse it seems some screen shots have boarders and others dont. Any reasons for this? Could it be because of individual set ups? @Sun we're a worldwide website, with most traffic from the US so makes sense to add it. We'll be adding EU conversions soon. It was an awesome game in it's day but I don't think it's aged that well. No, I'm not trolling...I've always loved the F-Zero games but I just feel that F Zero X and F Zero GX have stood the test of time far better, and will continue to do so even in another 20 years. F Zero X (N64) in particular I feel gets the gameplay and speed spot on, and the remixed music themes still sounds excellent even now. F Zero (SNES) is still fun, but it certainly doesn't have the same effect on me now as it did when I first played it back in 1992....it was only the forerunner to better things. The starter before the main course. I wouldn't score it any higher than a 6 or (generous) 7 these days. I would give this game a 7/10. It has tight controls and nice tracks, but you are somewhat limited in what you can do in the game. Great deal for 30 cents though! @Sun I totally think that you should be really pissed at them for that crap. I also suggest that NL show prices for Mexico, Canada, Uraguay, and Brazil. Absolutely unacceptable NL. I will not be reading your site for at least 30 mins due to your deplorable inaction. Shame on you. The game has not aged in 22 years and that is an amazing feat. I LOVE this game. Not X good, but still amazing! Great review Damien. Couldn't have said it better myself. @Marioman64 .... ah.... yeah. Had to think that through. But, you knew what I meant. Has anyone else also noticed issues with this game when playing it on the Wii-U gamepad. It looks perfectly fine and sharp on my 26 inch HDTV but when playing it on the Wii-U gamepad and getting up to full speed the image goes very blurry and a bit blocky when looking at the track and surounding landscapes in the distance. I searched on Google and found another site where someone else said they were having the same problem. If anyone else is if having the same problem it would be good to know. Getting worried that something may be wrong with my Wii-U gamepad screen. Hah I remember the explosions would scare me when I was younger! @ToxieDogg Can't agree with this at all. Prior to playing this game my only F-Zero experience was 20 mins on Maximum Velocity, so I don't have any nostalgic feelings towards it, and so far the game is stopping me from playing Tekken Tag 2. It's that good. This game is great. No nostalgia needed, it's just a great simple racer with fun tracks. @-KwB- Sorry, but my grammar Nazi-ism is kicking in. You mean, "I played this game the whole weekend! A-M-A-Z-I-N-G!! No space between the end of the word and the !. Okay! Sorry! Still holds up today as a great game. For thirty cents, it's a steal! @oOo-Sega-oOo The Snes had an unconventional resolution of 256 x 244 in most games (240p). On the HDTV, it's being scaled to either 720 or 1080p, way beyond its native resolution. On the game pad, it's scaled only to 480p, much closer than the higher resolutions. Also, keep in mind the data is being streamed to the game pad, so there's bound to be compression. How anyone can stand the look of the pixelated/unfiltered appearance on a large HDTV is beyond me. Looked better on an emulator or CRT. NES games are filtered as well, it's not your end or a defect, just the way the data is sent and compressed. Thanks for the info. Glad to hear it isn't my Wii-U gamepad screen that is playing up. i was starting to get worried. Had about 3 hours on this over the weekend and really enjoyed it. Not gotten very far, only finished the Knight and Queen leagues on beginner and done some practice runs. I haven't used save states... yet. Looks great on my TV. I think there are a few (occassional) graphical glitches on the gamepad, but hardly worth mentioning. Awesome sound track, which sounds brilliant when you plug headphones in the pad. I enjoyed this one a lot more than Maximum Velocity and i was always useless at X on N64, which i still have on cart. You could spin attack in the N64 version!!!! Cracking game, but not as good as the N64 version. 7/10 for me, now. For its time, 9/10 all the way. Next, a new F-Zero for WiiU. PLEASE!!! I actually really got into this game, though obviously not as much as this reviewer. As good as it is, it just doesn't have the replay value to hold such high praise, IMO, even for a game of its time. I remember playing this game as a kid years ago at a family member's house. Good times. On a side note, I still haven't touched the F-Zero game I received as a 3DS ambassador. I have been playing the crap out of this game! Oh and @Dpullam yeah the GBA F-Zero isn't near as good as this game. The GBA one is way harder it seems! "F-Zero" was the first game i saw on the SNES where i worked when the system was released in Germany. I was a die hard Sega fan till that moment, but this racer won me over for Nintendos new console. FZero and Super Mario World. Back then, Nintendo surely knew how to launch a system.